Summary and Definition: The New Freedom was the title of President Wilson's platform for change in which he attacked the Triple Wall of Privilege and fought unfair business practices. The Triple Wall of Privilege was the term that Wilson used to describe the banks, the tariff and the trusts. Wilson's New Freedom vision was to support small farmers and small businessmen by Reforming Tariffs, Reforming the Banks, taking Antitrust actions and breaking up monopolies. Woodrow Wilson also introduced important Social Welfare reforms and Federal Aid. Woodrow Wilson was the 28th American President who served in office from March 4, 1913 to March 4, 1921. One of the important policies during his presidency was the New Freedom platform and his attack on the Triple Wall of Privilege. Wilson's "New Freedom" versus Roosevelt's "New Nationalism"
President Wilson, like his predecessors Roosevelt and Taft, was a firm supporter of the Progressive Movement and Progressive reforms. The presidential election of 1912 saw Roosevelt standing for re-election against Woodrow Wilson. The men had different approaches to progressive reforms. Roosevelt and his Republican 'Bull Moose Party' stood for a program of New Nationalism favoring efficiency. Roosevelt accepted the economic power of the trusts but proposed new reforms to provide additional power to the federal government to regulate them. Wilson's New Freedom platform criticized Roosevelt’s New Nationalism program as one that supported "regulated monopoly", gave too much economic power to the federal government and failed to support small businesses, competition and free enterprise. President Wilson, like his predecessors Roosevelt and Taft, was a firm supporter of the Progressive Movement and Progressive reforms. The presidential election of 1912 saw Roosevelt standing for re-election against Woodrow Wilson. The men had different approaches to progressive reforms. Roosevelt stood for a program of New Nationalism favoring efficiency. Roosevelt accepted the economic power of the trusts but proposed new reforms to provide additional power to the federal government to regulate them. Wilson's New Freedom platform criticized Roosevelt’s New Nationalism program as one that supported "regulated monopoly", gave too much economic power to the federal government and failed to support small businesses, competition and free enterprise. Democrat resident Woodrow Wilson's vision of his New Freedom program was to completely destroy the Big Business trusts and monopolies, limit governmental power and restore free enterprise and a competitive market for small farmers and businesses. Wilson put forward the strong argument that freedom was more important than efficiency - and his New Freedom presidential campaign won the election. He wasted no time in introducing his progressive reforms. President Woodrow Wilson's reforms included Underwood Tariff Bill to help lower the general tariff rate from about 40% to 26% and re-impose Income Tax, the Federal Reserve Act, the reorganization of trusts and the 1914 Clayton Anti-Trust Act which banned price discrimination. Wilson's reforms also included Federal aid and Social Welfare reforms. A Tariff is a tax placed on goods that are imported from foreign countries. Woodrow Wilson believed that high tariffs were responsible for building up a collection of privileges and exemptions from competition resulting in powerful monopolies. 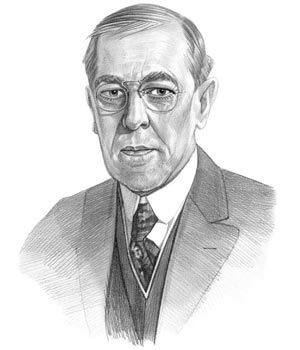 In 1913 Wilson signed the Underwood Tariff into law substantially reducing the average tariff on imported goods which he believed would encourage American manufacturers to increase efficiency and become more competitive with their prices. The Underwood Tariff, aka the Revenue Act of 1913, also re-imposed federal Income Tax. Public confidence in America's banking system was low due to the collapse of small banks during periods of depression in which many Americans had lost their life savings. There was no central bank and Wilson decided to take action to restore the confidence of Americans in banks. Woodrow signed the 1913 Federal Reserve Act into law that established a a Federal Reserve system regulated by a Board of Governors with the power to set the interest rates the reserve banks charged other banks. President Woodrow Wilson was determined to break the monopolies and trusts established by Big Businesses to the detriment of the small farmers and businessmen. Under Wilson's leadership Congress passed the 1914 Federal Trade Commission Act that created the Federal Trade Commission (FTC) in 1914 as his antitrust action to investigate and monitor American business practices. The Federal Trade Commission had the power to investigate companies and issue "cease and desist" notices against companies engaging in unfair trade practices, or those companies that damaged competition. The Wilson Antitrust Action was designed to limit activities that unfairly limited competition. President Woodrow Wilson was lobbied by Labor Unions for to exemption from the antitrust laws as their purpose was not to inhibit trade. As a result the Clayton Antitrust Act was passed into law which gave unions the right to exist. 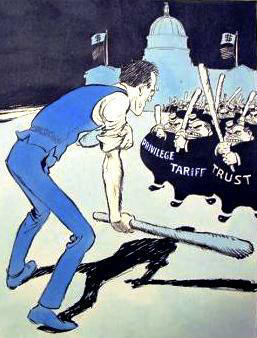 The Clayton Antitrust Act revised the 1890 Sherman Antitrust Act and banned monopolistic practices by business and affirmed the right of workers to go on strike. President Woodrow Wilson's New Freedom Reforms also included Federal Aid and Social Welfare reforms. The 1916 Keating-Owen Child Labor Act limited how many hours children were allowed to work prohibiting the employment of children under the age of fourteen in factories producing goods for interstate commerce. The Federal Farm Loan Act was also passed during his presidency which created 12 Federal Land Banks to provide small farmers with long-term loans at low interest rates. Another important law to be passed was the 1916 Adamson Act, which established the 8 hour working day for railroad workers. The info about the New Freedom provides interesting facts and important information about this important event that occured during the presidency of the 28th President of the United States of America. The article on the New Freedom provides detailed facts and a summary of one of the important policies during his presidential term in office. The following Woodrow Wilson video will give you additional important facts and dates about the political events experienced by the 28th American President whose presidency spanned from March 4, 1913 to March 4, 1921.